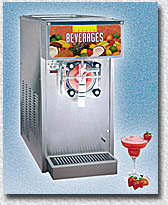 Contact us today to experience how a frozen drink machine can make your party a memorable one ! Tired of crushing ice in a blender? Rent a frozen drink machine from A Frozen Creation and you'll free yourself from blender duty for good! Our machines are clean, reliable, and the best in the business. Our high capacity machines are self-serve and free you up to enjoy your party. No ice needed. Just fantastic drinks every time! Combine superior equipment with our delicious drink mixes and you have all you need for a great party! You be the judge. Give us a call and let A Frozen Creation make your party a memorable one! #1 Classic Margarita -- it never fails to lead the flavor pack! #2 Strawberry Margarita -- fresh fruit flavor makes it a winner! #3 Strawberry Diaquiri -- for the rum lover in you! #4 Peach -- as refreshing as it gets as a diaquiri! #5 Hurricane -- great fruity flavor! Kids love it! Delicious as an adult beverage and just as great as a no-alcohol drink!